For every action, there is a reaction. Everything we do in life has consequences, some positive, some catastrophic. 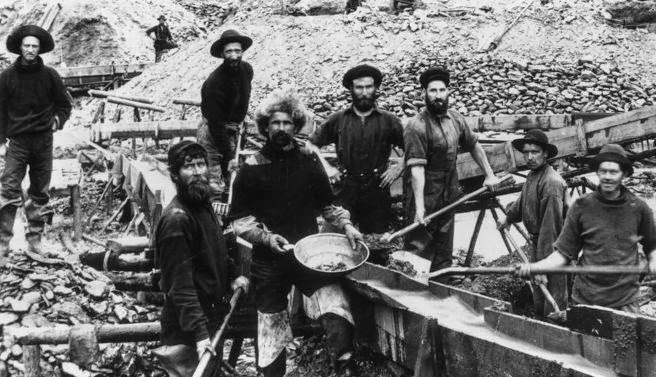 The Klondike Gold Rush was no different. 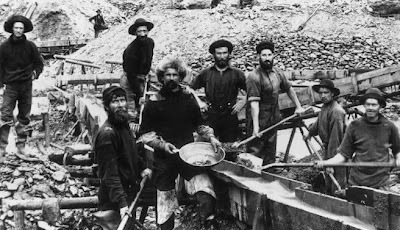 Although some of the prospective miners were driven by a sense of adventure and by the desire to explore and see new things, many were driven by greed and were ruthless in their methods of obtaining gold. Primitive mining methods, such as digging sediments by hand from stream banks and underground tunnels, seemed harmless enough; but these left extensive damage to the stream and river beds. When the larger mines were established, hillsides and entire mountains were plundered and silt and mud filled the waterways. Forests were completely stripped in order to supply timber for building boats and for feeding the fires needed to melt the sediments. As the twentieth century rolled around, the richest and most easily accessed gold deposits had already been depleted, and harsher, more destructive machinery, designed to reach the deeper deposits and process the sediment faster, was brought in. High-pressure hoses completely knocked down hills in the ruthless search, and huge dredges reworked entire waterways. The destruction was colossal. This total loss of natural habitat resulted in annihilation of both land and aquatic wildlife. In addition, an overabundance of mercury, which was used to process the gold, can still be found in the Yukon. It has made its way up the food chain and still accumulates in fish and other wildlife in alarming concentrations, resulting in health risks among humans and animals alike. The ones who suffered the most from extensive destruction were the first nation's people, including the Tagish, the Tutchone, and the Tlingit. Because of its massive mountain ranges, ice fields, harsh terrain, and wild rivers, the Yukon had always been extremely hard to access; and before the gold rush, these First Nations groups had been quite isolated from the outside world. No wonder the Yukon was considered the last unexplored and unmapped region in North America! With the influx of white man seeking gold, all of this changed. Miners brought diseases that the first peoples had no immunity to, and in many areas, entire tribes were wiped out. Hunting and fishing grounds were destroyed, making food sources scarce, and what wildlife remained was laced with high concentrations of mercury. Some of the natives worked as packers or as suppliers of wood for steamboats. They were unaccustomed to cash however, and few ever profited. Their traditional lifestyle was lost forever. Everything we do, everything we say, and even everything we think can have dire consequences. In fact, I have never met anyone who could assure me that all of his or her actions have always had positive consequences. The one who lovingly died on the cross to bring salvation to this world. Dear Lord, we thank You that even though we have sinned YOU have made a way for us to be forgiven. We pray today that we would have a positive influence on those around us. I Jesus’ Name, Amen.